SPECIAL ED COSTS: Jackie Wilson, superintendent for the Bennington-Rutland Supervisory Union, told the House Education Committee on Wednesday that the high cost burden of special education for independent schools impacts supervisory unions, and hence taxpayers. 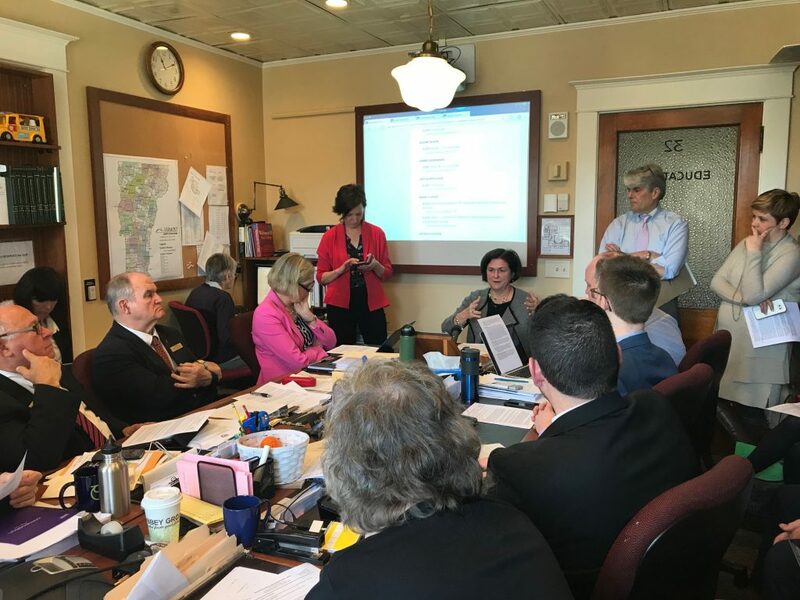 MONTPELIER, Vt. — According to testimony from both the public and independent education sectors to members of the House Education Committee, proposals to increase special education requirements for independent schools will ultimately hit taxpayers. This is because when supervisory unions send children with special needs to independent schools, the financial responsibility for that’s child’s needs falls back on the supervisory union, and ultimately, on taxpayers. State lawmakers are considering two bills relating to this matter. S.229, which addresses approval of independent schools by the State Board of Education, is currently in the House Education Committee. H.897, regarding the effectiveness, availability and equity of special education services, is now in the Senate Education Committee. Lawmakers are trying to merge the two bills into one, but not everyone supports the idea. 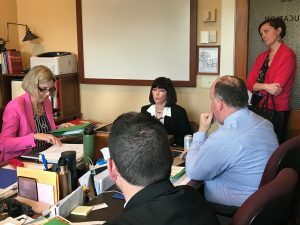 “The attempt to add S.229 to H.897 concerns us greatly,” Jackie Wilson, superintendent for the Bennington-Rutland Supervisory Union, said Wednesday in testimony before the House Education Committee. She said according to the current language in H.897, public schools would get reimbursed for special education costs based on student count, whereas the independent schools would receive money on a per-service type model. So with a set amount of money, public schools will have the incentive to implement cost-saving measures to their special education services, whereas private schools will have no such incentive as they get more money for increased services. Currently about 800 of the Bennington-Rutland Supervisory Union’s 2,100 students attend independent schools. She said while the state reimburses special education costs to the supervisory union, that’s only about half, so the other 50 percent is going to be put on taxpayers. She said the only other option after raising taxes is to cut education resources at the public schools. She also said it’s troublesome that the supervisory union would pay for services at the independent schools that they have liability for but no oversight. Mark Tucker, superintendent for the Washington Northeast Supervisory Union, told the lawmakers that, especially for small independent schools, the burden on supervisory unions is even greater. “What happens for the smaller independent schools who do not have the economy of scale to have a special education department?” he said. Another concern Tucker highlighted was the lack of capable special education personnel. Patricia Komline, a lobbyist for the Vermont Independent Schools Association, gives testimony Wednesday before the House Education Committee. He reminded lawmakers that the hiring pool is not getting any bigger, and pitting private and public against each other with different reimbursement models is only going exasperate the situation. And for rural geographic areas, he said finding the kind of talent needed to take on these kids is an even greater challenge than for schools in the cities. Patricia Komline, a lobbyist for the Vermont Independent Schools Association, echoed most of the concerns expressed by Tucker and Wilson. “In light of our experience with pre-K and working to do something that sounded good but logistically continues to be a real problem, we’re just asking that you please proceed with caution,” she said. Like Tucker, she emphasized the challenge to smaller operations. Often times, and I stress the word OFTEN, when a child moves on to an independent school we find out that the child did NOT need special education services or the often prescribed magic pill. (Usually prescribed for benefit of the teacher not the child) The child needed a different setting, different personnel and different teaching methods. (At a huge savings to taxpayers) Once the public school monopoly has sunk its teeth into a vulnerable young person, the label is there and the federal money flows to teachers union jobs. The reality is this, these public education monopoly cheerleaders don’t like competition, first and foremost for these people is the promotion and retention of union jobs. It’s disingenuous when teachers union mouthpieces pretend to have student outcomes and taxpayer needs as their top priority. The proposed advisory group consists exclusively of dozens of Vermont education special interest groups, including your favorite, heavy weighting for the VT NEA. There appears to be no stopping this education juggernaut because the Vermont electorate consists of a dysfunctional and conflict-of-interest ridden majority, including politicians, appointed administrators, government employees, special interest lobbyists, social service recipients and intimidated parents. Check out ‘Obedience to Authority: The Milgram Experiment’. Only fair. The parents are still paying public education taxes to the town despite the fact that their kids don’t go there. They should get something for their taxes. Better yet, they shouldn’t have to pay those taxes at all. Someone has to pay for the service. Not if they aren’t using them. We do all use the service. There is this concept of ‘social responsibility’. We all benefit from a well-educated population and should, therefore, contribute to it. It’s like insurance. We all pay a little every year, so individuals don’t pay a lot when it’s their turn to use the service. Unfortunately, as with insurance, the education system has become corrupted by those who rely on the dysfunction the system is intended to cover. It’s not that the concept of ‘social responsibility’ is illegitimate. What’s illegitimate is the corrupt gaming of the system by special interest groups, often at the expense of those its designed to help. Socially funded education, like insurance, should only cover the base essentials. That’s not the case today. Dysfunction has become a growth industry and we should stop kidding ourselves. They do it ‘for the money’, not ‘for the children’. Home schoolers don’t use public school facilities. Home schoolers don’t require bus transportation. Home schoolers don’t need meals provided. Home schoolers don’t purchase uniforms; home school teachers wages are zippo whereas public school indoctrinators yank down big bucks and little input time. You are right! Public school teachers do it for the money; private teachers do it for the love of students and teaching their kids what is RIGHT; not what is PC. Public schools are destroying the country. Private schools are our only hope. When $$ runs out for the public schools they will change; not until then. I don’t have children,and still have to pay.I also went to private schools when I was a child,so nothing owed there either. But who is your plumber, your electrician, your doctor or lawyer? Ostensibly, through ‘public’ contributions to education, we all subsidize a better educated and, therefore, better performing society that benefits us whether we have children, or attend private school. The problem isn’t that we contribute to the ‘general welfare’ of the United States (Article 1, Section 8 of the U.S. Constitution). The problem is that the public funding has been monopolized by public sector special interests. The Sherman Antitrust Act was one of the first Federal statutes to place limitations upon monopolies in the private sector. Unfortunately, when government has the authority to grant monopoly status to various organizations, it grants that status to itself. Vermont’s public education system is a perfect example. And the results have been predictable. In Vermont we now have the most expensive K-12 public education system in the United States, for that investment fewer than half of Vermont’s students meet grade level standards and now we’re seeing a preciptous decline in student enrollments. It’s counterproductive to complain because we don’t have children or that we were wealthy enough to afford private school. We should insist, however, because ‘the general welfare’ is a constitutionally recognized social responsibility, that public sector monopolies be prohibited just as aggressively as they are in the private sector. And the best way to do this in education is to provide comprehensive school choice vouchers allowing parents and educators to negotiate the specific terms of exchange by which they both expect to benefit. Not true! I don’t understand why educators from all camps play this ‘good cop’/’bad cop’ routine. Perhaps it’s the reporter who missed the nuances of the discussion. In either case, it’s a disservice to TN readers. . This distinction between ‘public’ schools and ‘independent’ schools regarding the cost of Special Education (SPED) services is irrelevant and misleading. Ostensibly, the Individual Education Plan (IEP) Team that directs a student’s SPED program chooses the school that best meets the needs of that student’s needs, whether it’s in a public or independent school. The IEP Team’s decision is based on the determination that the chosen school is or will be equipped to provide those services. But most importantly, the cost of a SPED program doesn’t ‘fall back’ to anyone. SPED cost rests with the sending School District taxpayers, period. And the first 40% of those costs are significantly subsidized by Federal Grants administered by the Vermont Agency of Education, again, whether the services are provided in a public school or an independent school. There is another subtle but important distinction in SPED costs not mentioned in this article. Please read on. In my school district, for example, we have 7th & 8th grade tuitioning (i.e. School Choice). Parents typically choose between a half dozen or so public and independent school programs. Some of the independent schools provide significant Special Education (SPED) services and are, in fact, chosen for that reason. But more importantly, in our School Choice 7th & 8th grades, SPED costs per total enrollment are typically 75% less than they are in our designated public K-6 and 9-12 programs. That’s right. We typically spend about $3000 in SPED costs per total student enrollment in grades K-6 and 9-12 and only $750 per total student enrollment in our tuitioned 7th & 8th grades. The anecdotal evidence for the difference is that when parents have the option to choose the school that best meets the needs of their children in the first place, public or independent, the initial need for SPED services declines. I look forward to the day when educators and reporters alike exercise the due diligence we expect when reporting on this issue. These special ed students seem to congregate in Milton. I know it sounds funny, but that happens to be true. Milton seems to have the best benefits for special needs kids…or the state just channels them there. Not fair for Milton. Take one look at the mess these folks work in it’s a wonder anything usefull come out of these sessions. Again, Mike…I suspect ‘the mess’ is of ‘these folks’ own making. The system need not be as dysfunctional as this report leads us to believe. Please feel free to comment on my observations noted above.